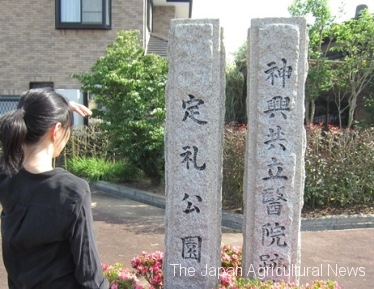 Former site of Jingo Kyoritsu Hospital, which was established in 1899 by villagers of Jingo village of former Munakata county of Fukuoka prefecture, aiming for promotion of resettlement of doctors. The site is used as “jorei (fixed remuneration) park” (in Fukutsu city, Fukuoka prefecture) . It is former Munakata county of Fukuoka prefecture facing the Genkainada Sea. This region, which is sandwiched between two government-designated cities, Fukuoka city and Kitakyushu city, is said to be “hometown of the health insurance system”. To solve the question, Inoue surveyed and listed the result in Munakata County Doctor Journal from September 1976 to April 1978. And then he published “The headwaters of the health insurance, jorei of Chikuzen Munakata” (the Nishinippon Shimbun newspaper) . In the park there is a bulletin board that explains on the National Health Insurance system and jorei. The words unfamiliar was returned. Inoue asked, ” How do you write jorei in kanji?”. One of the elders wrote the word, “定礼(jorei, fixed remuneration)”, another elder wrote different word, “常礼(jorei, usual remuneration)”. Initially he thought that such difference of words could have derived from mistake of their memories. However, he noticed that there was each meaning to each word. “定礼(jorei, fixed remuneration)” might have been used for meaning of fixed amount of remuneration to the doctor in accordance with patients’ financial power regardless of the degree of effort. In contrast, “常礼(jorei, always remuneration)” might have been used for meaning of remuneration to the doctor always taking care of patients. Using way of the words were different by regions. These two words are not listed in present Japanese dictionary including “Kojien”. The elders knew the word “mutual aid” from childhood. At first, one of elders said, “The most impressive memory was my father’s teaching. When I said that it was useless to pay rice to the doctor in spite of no problem of health, my father said that all house had to “karau(burden)” it each other in preparation for struggling with illness.” “Karau” is dialect of “ninau (burden).” Mind of mutual aid had been penetrated into everyday life. Everyone had cooperative spirit. Interior Ministry had embarked on the investigation. According to some reports, doctors had been called only for the death certificates. Treatment costs had not been paid to the doctor. This had caused the depopulation of the doctor, leading “doctorless village” at last. In order to lighten the burden of medical expenditure, it was necessary to diversify the burden risk by sharing of many people, like modern “kyosai (mutual insurance)” and “hoken (commercial insurance).” Social Affairs Department of the Interior Ministry announced the draft of the National Health Insurance bill in July 1934. Public opinion was in favor of the purpose of the bill mainly. But many people had negative view that it was difficult for rural areas to accept the scheme, because people thought that rural areas had different consciousness from the urban workplace. Soon, the ministry received a report from Kyushu island. It reported jorei (fixed remuneration). The ministry dispatched investigators to Munakata. Investigators fell silent. They were noticed rural wisdom which was much better than the thought planned in Tokyo. It was said that they were convinced that it was possible to establish National Health Insurance (NHI). Interior Ministry added the words, “in accordance with the spirit of sofu (mutual aid) and kyosai (mutual insurance) …”, in Article 1 of the bill, at the establishment of the system. At the time, there had not been any precedent that defined such spirit in the law. In April 1938, NHI was launched. At that time, the Social Affairs Department of the Interior Ministry was renamed the “Ministry of Health and Welfare”. In Munakata, conversely, joining the National Health Insurance was delayed. Because “it is not necessary to join except for jorei.” Doctors recommend the National Health Insurance as “renamed jorei,” leading to all household subscription finally. In our country, there had been mutual aid organization for a long time. They were Tanomoshiko or Mujin (mutual aid finance system) born in the Middle Ages, system of sanso (three storehouses) (Giso, Joheiso, Syakura) of the Tokugawa era, and Goningumi (5-person group). And now, there is business of “kyosai (mutual insurance)“ based on nogyokyodokumiai (agricultural cooperatives, or “nokyo”) law. 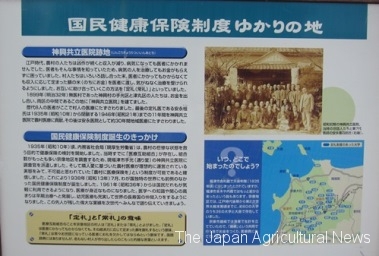 We disclose the history of the “JA (Japan Agricultural Cooperatives) insurance”.